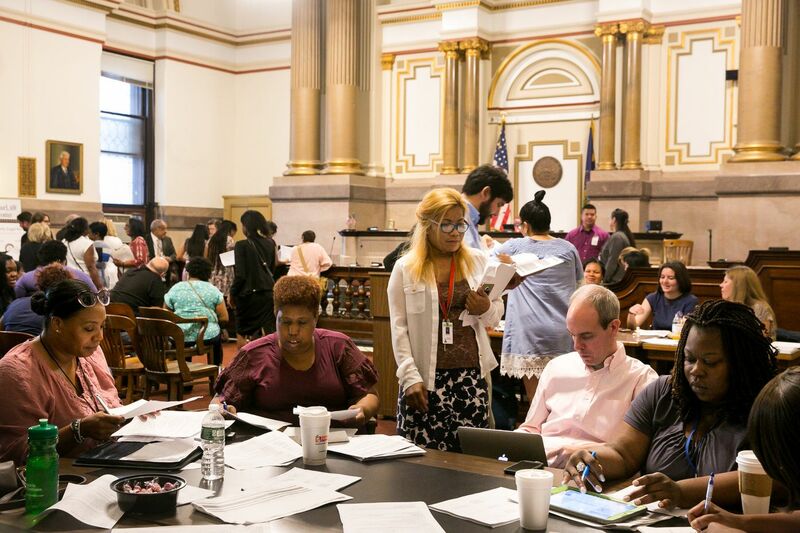 Inside Courtroom 676 in Philadelphia City Hall, a group of volunteer housing counselors gather around a table every Thursday morning and afternoon. Together with pro bono attorneys, they try to help homeowners stave off foreclosure through Philadelphia's Residential Mortgage Foreclosure Diversion program. Two months and 13 days before Linda DaCosta stepped into Courtroom 676 in Philadelphia City Hall, the single mom of twin girls answered a knock she never expected. It happened on a Sunday, just before dinner, on one of those crisp April days that made her love West Philadelphia. Inside her newly renovated condo, her grade-school-age girls were watching TV. DaCosta, a 41-year-old nurse, had joined in, taking a reprieve from divorce filings, night shifts, and job applications that had consumed her for the last year. Then came the knock and the doorbell, buzzing again and again. A man was outside, holding a stack of foreclosure documents. DaCosta was being served. DaCosta, who left her full-time job as a clinical nurse coordinator in June 2017 to care for a sick family member, knew that her mortgage situation was dire. The missed payments had accumulated since September of last year, ballooning until April. But never did DaCosta think her bank would foreclose — after all, she had been negotiating to modify her loan, she said. Still, the lawsuit came. And by the time it did, DaCosta owed more money on her house than she had initially borrowed. Linda DaCosta, a West Philadelphia resident, began missing payments on her condo in September, as a leave of absence of work and divorce demanded her time and finances. This year, her lender initiated foreclosure proceedings. She attended the city’s Residential Mortgage Foreclosure Diversion Program this month. "I was standing at my door, and I'm hyperventilating. I'm saying to myself, 'You have to calm down. The girls can't see you like this,' " DaCosta said. "From there, the rest of the day was a full-on panic." Immediately, DaCosta called her lender, who told her to appear in court on the scheduled date, she said. But as time passed, stress mounted, and as more bill collectors called, DaCosta began to wonder: Should she bother with court at all? "I was so low … I thought, what are we going to even do" in court? DaCosta said. She was intimidated and confused about how it would work. "There were so many things that told me, 'Don't go.' "
Yet on July 5 — 15 minutes before she was due to arrive — something, somehow changed DaCosta's mind. So that Thursday, she strode into the courtroom and took a seat in the row of worn, wooden chairs in the center of the room. Courtroom 676 appears to be an ordinary courtroom inside the winding hallways of City Hall. Gold columns tower behind the court's bench, while oil paintings of judges decorate the walls. A jury box sits in the corner. Flags rest in place. Every Thursday, however, the courtroom transforms. Court is in session, yet no judge presides. Defendants like DaCosta appear, but no jury decides their fate. The city has operated its Residential Mortgage Foreclosure Diversion Program every week since April 2008 with one mission: keeping residents in their homes. Spearheaded by Judge Annette M. Rizzo to combat the foreclosure epidemic that sprouted from the Great Recession, the program — considered the first in the nation — still has thousands of participants today. Inside Courtroom 676 of City Hall, pro bono attorneys, housing counselors, and lawyers for mortgage companies work together to prevent homeowners from losing their houses to sheriff sale. The result is what even some staffers call "organized chaos." Each week, dozens of sharply dressed attorneys for mortgage lenders square off against the city-funded counselors and attorneys, hashing out deals at tables, banisters, and in corners of the room, as homeowners look on. Intermittently, counselors will scurry back to a homeowner, asking questions or distributing paperwork. If any disagreements arise, a presiding law clerk helps settle them then and there. To observers, the simultaneous negotiations may seem impossibly casual. But in the last decade, the program has saved more than 11,808 homes, according to city data, a 55 percent success rate. A total 21,399 homeowners have participated in the program, data show, though 9,600 homeowners citywide still eventually lost their homes. Nearly 5,900 others are currently participating. Attorney Bob Lukens, back center, works in Courtroom 676 of City Hall, where the city’s Residential Mortgage Foreclosure Diversion program takes place every Thursday. Compared with 2009, when foreclosure filings in Philadelphia surpassed 8,000 annually, according to data from the local Reinvestment Fund, the volume of foreclosure filings has diminished — though not disappeared. In May, one in every 978 homeowners in Philadelphia experienced a foreclosure proceeding, according to Attom Data Solutions — a rate that exceeds thousands of other cities nationwide. And many of today's filings are no longer linked to bad loans of the mid-2000s, the data show. "We can blame this less and less on the last crisis," said Daren Blomquist, senior vice president at Attom. "I'd be more confident that it's an indication of an underlying, fundamental issue with the economy." The housing counselors and attorneys who sit in the room — hailing from jobs at community development corporations or firms like Community Legal Services and SeniorLAW Center — say there is no one reason why homeowners come to the program. Participants are old and young, black, white, and Latino, suffering from job loss, disease, or disabilities that set them on the path toward foreclosure. Some are like DaCosta, well-educated and established, but down on their luck. Others have struggled for years. A map of the more than 11,000 homes that have been saved as a result of Philadelphia’s Residential Mortgage Foreclosure Diversion Program. Many homeowners who arrive these days, according to staff, are seniors with federally insured loans called reverse mortgages, which allow homeowners older than 62 to convert their home's equity into cash. But as the number of these loans has risen in recent years, so has the number of foreclosures, as senior homeowners, still obligated to pay taxes and insurance on the house, let those payments lapse — triggering legal action by a lender. According to AARP, a senior citizen interest group, reverse mortgage foreclosures increased more than 600 percent in 2016. As a whole, about 80 percent of homeowners who receive notices ultimately show up in court, according to the city. Those who don't, by contrast, face much slimmer chances at success. Of the nearly 6,000 homeowners who did not participate in the diversion program in the last 10 years, more than two-thirds eventually lost their homes, city data show. To get homeowners into the courtroom, city officials rely on more than just legal paperwork. Neighborhood-based nonprofits go door-to-door to visit homeowners in default, a city spokesperson said, and mailers are distributed. The multimillion-dollar program is funded through the Division of Housing & Community Development budget. With Philadelphia's foreclosure caseload having fallen and with newer federal guidelines that better dictate the foreclosure process, some lenders — all of whom are required to participate — have asked how much longer the program should last, according to one attorney who represents lenders. Others on the lending side view the program as generally positive. According to Michael McKeever, a managing attorney at KML Law Group who previously represented lenders in the program, the conferences are a "well-managed" way to bring together competing interests. Even more successful, McKeever said, is the work that happens beyond the mortgage modifications. "It's not just about getting payments to resume," McKeever said. "There may be a waterfall of things happening to a family. … So the first thing out of the gate is, can we get a budget? What might be available in state and local aid?" After being paired with a housing counselor when she arrived in court, DaCosta was ushered into a classroom, where an instructor mapped out the months ahead. There would be budgets to create, online courses to take, and paperwork to complete. Homeowners, instructors stressed, must follow the months-long process through. By the time she finished, DaCosta said, she felt relieved. The shame and stress she carried had begun to thaw. "I had a six-figure income. I have two degrees from the University of Pennsylvania. I'm a registered nurse," DaCosta said last week after meeting with her counselor for a second time to apply for her mortgage modification. "People will say, 'What did you do wrong?' Nothing. It's life, and life happens." Philadelphia residents in foreclosure or behind on mortgage payments can call the Save Your Home Philly Hotline, operated by Philadelphia Legal Assistance, a program participant, at 215-334-4663. Linda DaCosta, a registered nurse, has begun meeting with her assigned housing counselor, in the hopes of modifying her loan with her mortgage lender.